Building or opening a new plant or office is an exciting time for any company. But the "to do" list can be long and intimidating, with innumerable details to be addressed. GMS can help cross one item off the list: Creating a lush, healthy lawn to accent your new facility. We have extensive experience in creating new lawns with sod or seeding. 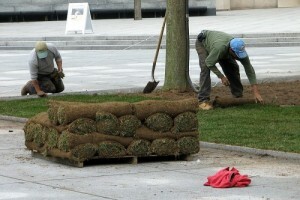 Sod installation is the quickest option. Our sod is sourced from local growers, and pre-installation fertilization helps jump-start its long-term growth and health. If needed, we'll grade the ground beforehand to ensure proper growing conditions. If you prefer to grow your lawn, we'll prepare the soil and seed it with a blend especially chosen for the climate in Brookfield, New Berlin and Elm Grove. Business can be hard on lawns. The grass on many commercial properties is often damaged by delivery vehicles, semitrailers and snow plowing. If your lawn is looking a bit rutted, we can smooth it out and nourish it back to health. If your lawn is intact but spotty in places, we'll patch it with spot sod installation. We want the grounds around your building to be a source of pride for everyone in the company. Whether you're creating a new lawn at your business or fixing up an existing one, GMS will use proven, effective methods to start your grass and keep it growing. We'll give your lawn our full attention, because your business deserves yours. Call or click to receive a quote for lawn grass seeding or sod installation at your business or commercial property.